Happy holidays! This Christmas Eve felt like an appropriate time to focus on White Christmas, the most successful film of 1954 and one of the most beloved holiday classics. Every year around the holidays, my mom and I set aside an evening for “Bing and Booze”, mixing cocktails and watching White Christmas while wrapping presents for friends and family. Luckily for Bob and Phil, “Freckle-Face Haynes, the dog-faced boy” had two sisters that fared considerably better than he in the looks department. Phil and Judy (Vera-Ellen) are immediately taken with each other, but Bob and Betty (Rosemary Clooney) are a touch more combative and cynical. Ever the schemer, Phil ropes Bob into performing the Haynes sisters’ signature act, “Sisters”, to allow the two women enough time to escape their irked landlord and the local sheriff. 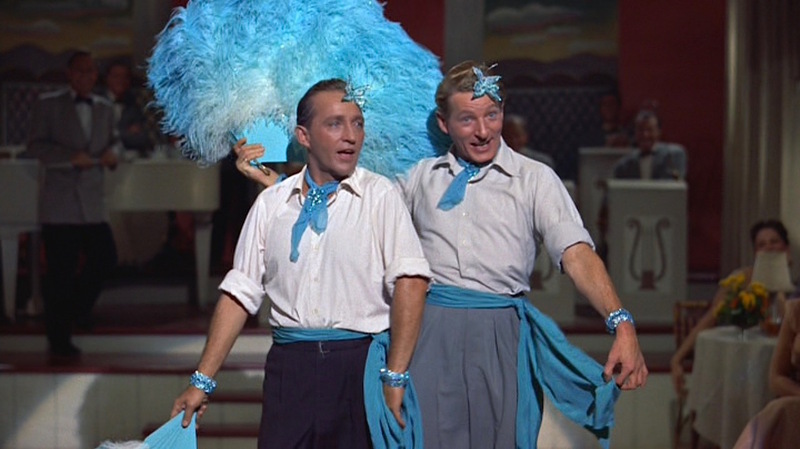 According to Clooney, the sequence of Bob and Phil performing “Sisters” was not in the original script but emerged when director Michael Curtiz was amused by the actors clowning around on set and decided to film it. 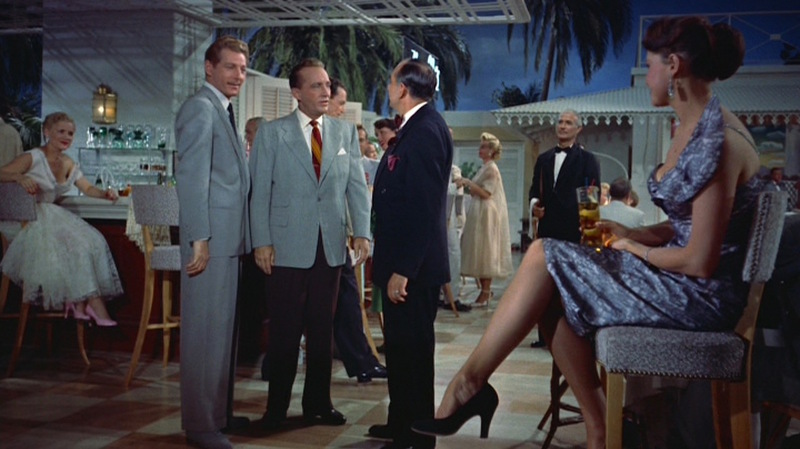 The final take used in the film shows Bing Crosby unable to control his laughter while performing the duet with Danny Kaye. Bob: Miss Haynes, if you’re ever under a falling building and somebody runs up and offers to pick you up and carry you to safety, don’t think, don’t pause, don’t hesitate for a moment, just spit in his eye. Betty: What did that mean? Bob: It means we’re going to Vermont. 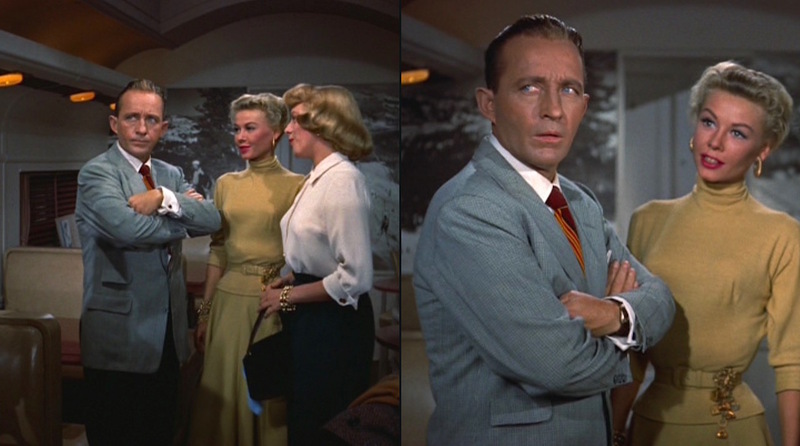 White Christmas wasn’t Bing’s first time in costumes designed by the legendary Edith Head. “Having done costuming for a number of Bing Crosby and Bob Hope’s Road pictures prior to White Christmas, [Head] knew exactly how to make Crosby’s character shine,” notes Jeff Saporito for ScreenPrism. Indeed, Crosby’s character shines off the screen from the start with a powder blue jacket that vividly echoes Bing’s eyes. The suiting consists of a subtle mini-check with thin blue widely-spaced over-stripes on a powder blue ground. 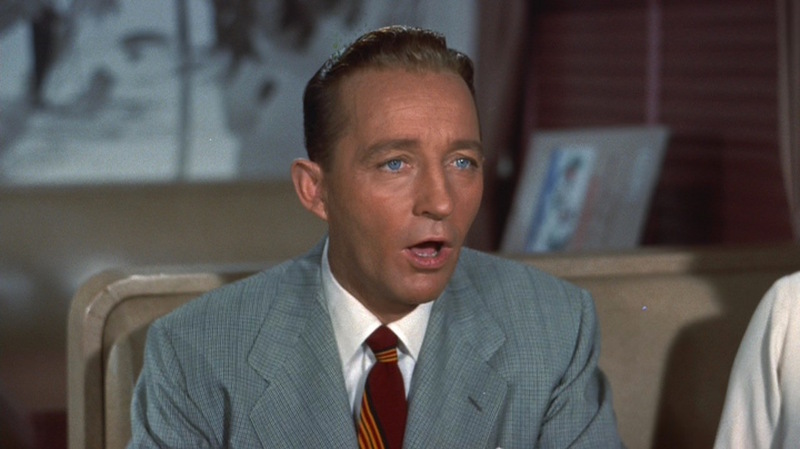 The powder blue jacket calls out Bing’s vibrant blue eyes. Bing Crosby’s odd jackets (i.e. 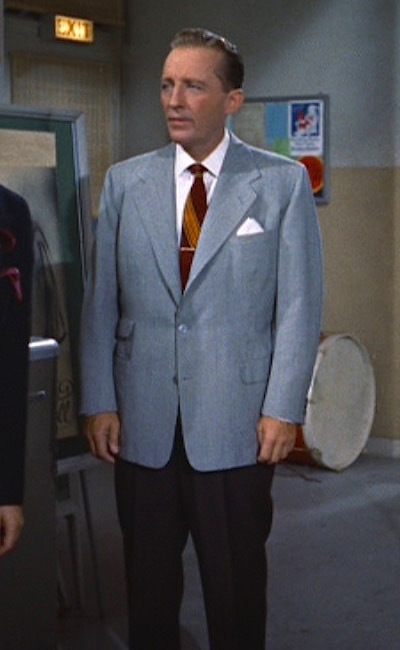 non-suit jackets) in White Christmas all have a 3/2-roll front as the wide notch lapels roll over the top button, leaving two exposed, of which Bing correctly fastens only the top-showing center button. All buttons, including the three buttons on each cuff, are a mixed light blue. Phil sells Bob on yet another scheme. 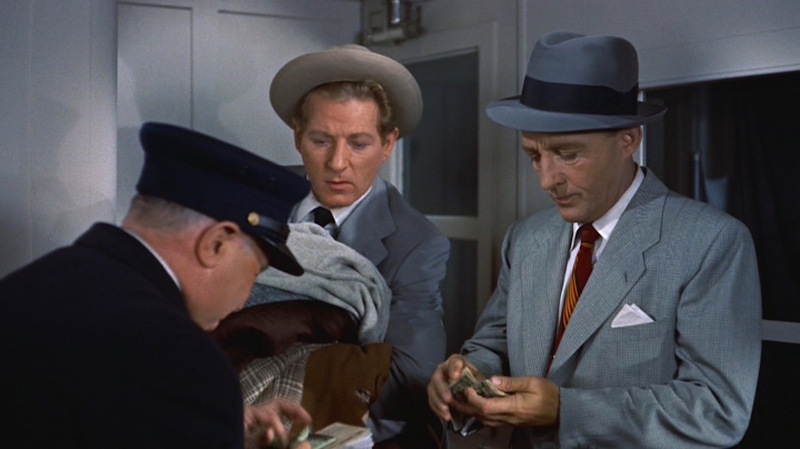 A common characteristic of all of Bing’s White Christmas jackets (including his suit coats) is the presence of a narrowly flapped ticket pocket positioned just above the right-side hip pocket. Both hip pockets are flapped, and the jacket also has a welted breast pocket where Bob/Bing wears a white pocket square folded to show a single point above the welted opening. The jacket also has double vents. A conflicted Bob has to quickly balance his annoyance with Phil with his quiet delight that the Haynes sisters are indeed on the same train. In real life, Bing Crosby was a client of H. Huntsman, the legendary Savile Row tailor that has cut for celebrities from entertainers to royalty over its 170+ years in existence. I’m not sure if this or any of his White Christmas costumes were tailored by Huntsman, however. 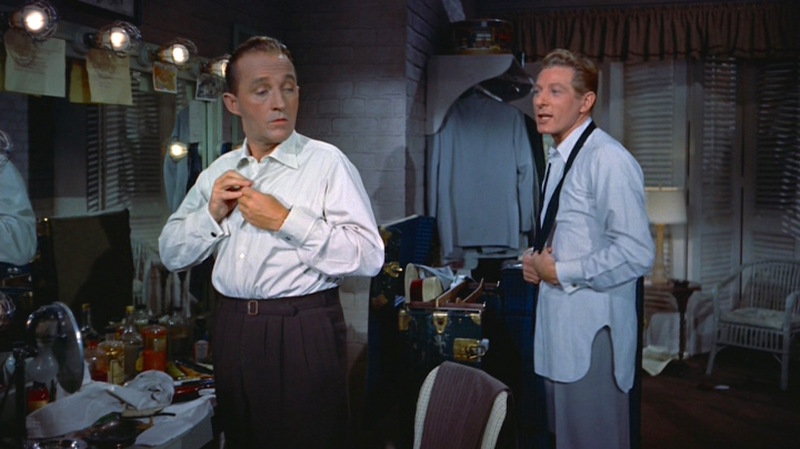 Following the last Wallace and Davis show of the year, Bob Wallace removes his costume in their dressing room and buttons up a white shirt with an era-appropriate large semi-spread collar, plain front, and double (French) cuffs already fastened with a set of blue glass cuff links. Note the reflection of the blue glass cuff links on the varnished table of the train’s “drafty old” club car. 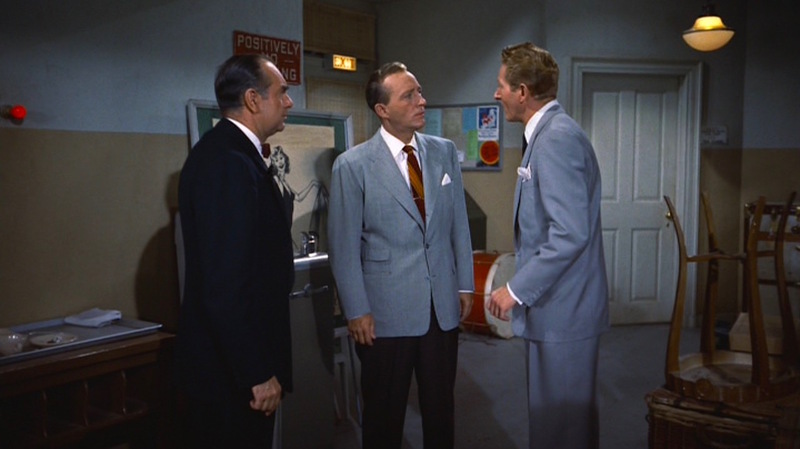 Aside from a brown pinstripe suit, almost all of Bing’s wardrobe in White Christmas incorporates some element of red, whether it’s a red shirt, red socks, or – as we see here – a predominantly red tie. This ketchup-and-mustard, er, crimson-and-gold tie consists of sets of crimson red and mustard gold stripes, each set bordered by a black stripe, running “downhill” from right-down-to-left on a crimson red ground. Bing holds this tastefully wide tie in place with a slim gold tie bar. Bob is reasonably frustrated by Phil’s blatant matchmaking efforts. Bob dresses in a pair of dark chocolate brown wool trousers with triple reverse pleats, providing an extremely full fit that was not uncommon during the pleat-happy postwar years. The trousers have cuffed bottoms, straight pockets along the sides, and no back pockets. The trouser fit adjusts around the waistband with a half-belt in the front that adjusts through a gold-toned buckle. Bob dresses for an evening out with Phil and the mysterious Haynes sisters. 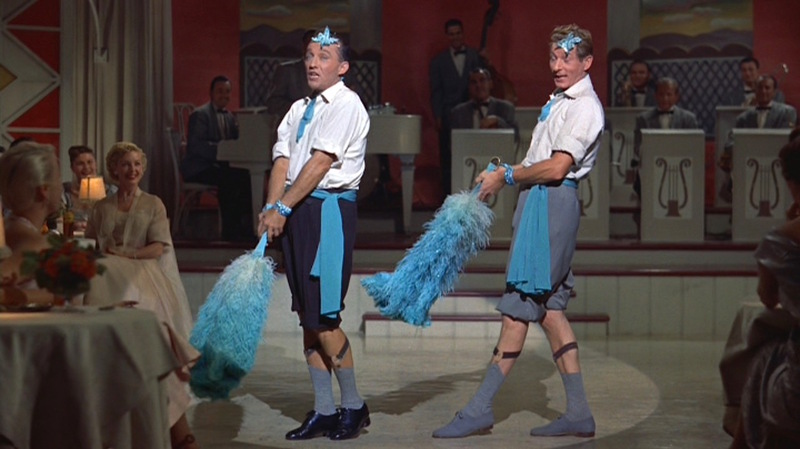 When Wallace and Davis take to the Novello’s stage for an encore performance of “Sisters”, Bob has his trouser legs rolled up to show off his gams, although he appears to be wearing a different pair of dark gray trousers with one or two less pleats to them. The “Sisters” sequence also gives us a better look at Bob’s shoes, a pair of black leather cap-toe oxfords worn with gray cotton lisle socks held up with brown garters. 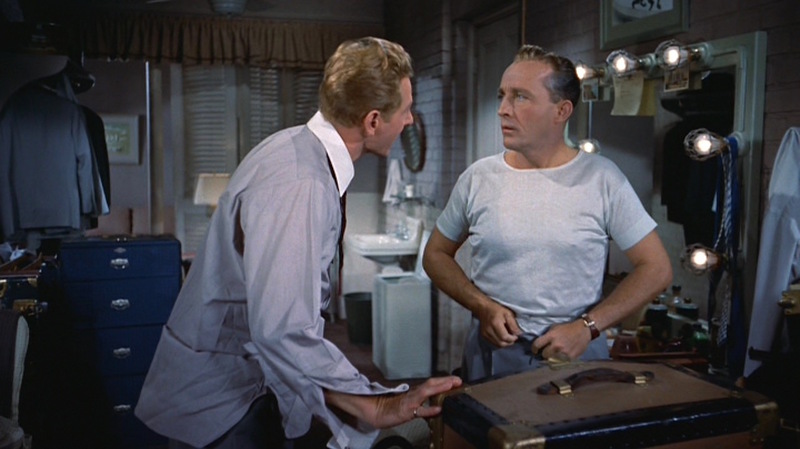 Bing Crosby bestows White Christmas audiences with a look at his white underwear, a cotton undershirt with a wide crew neck and reinforced short sleeve hems and a pair of white cotton briefs briefly glimpsed while changing his trousers after the show. Fans curious to see Bing’s tighty-whiteys will just have to watch the movie. 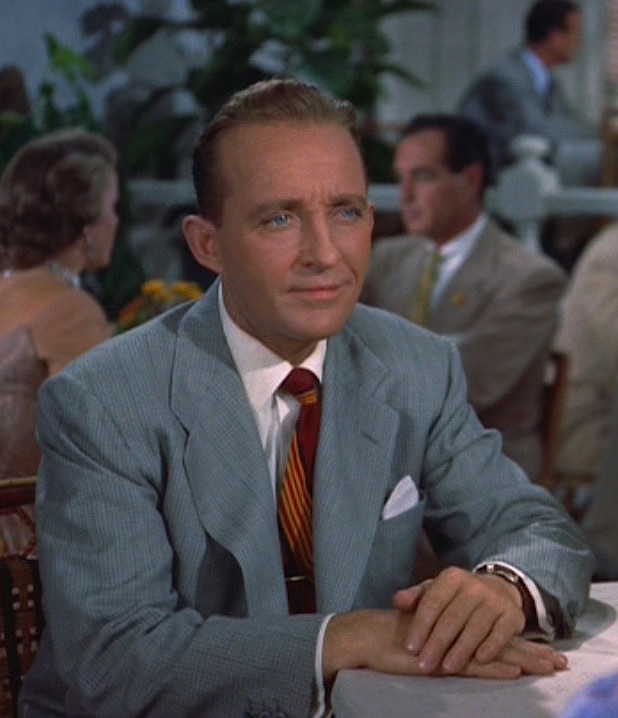 Bing Crosby wears his own wristwatch in White Christmas, a plain gold-toned watch on a tooled brown leather curved strap with a gold single-prong buckle. 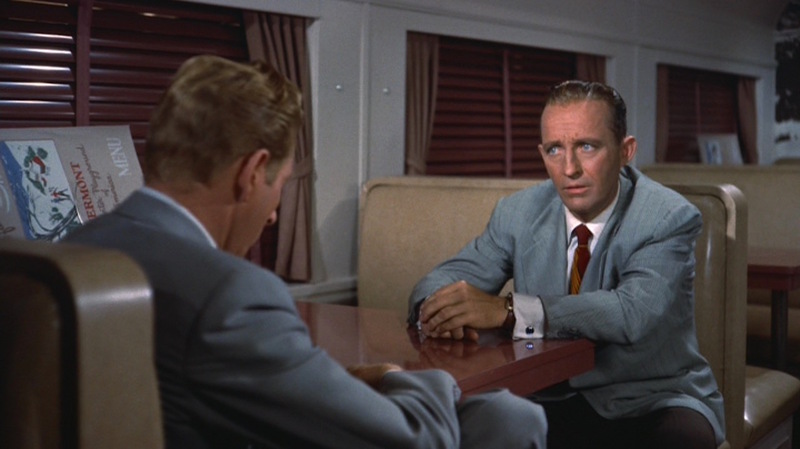 The watch appears in several other Crosby flicks of the ’50s such as High Society, where he also wears it with the timepiece on the inside of his wrist; though this could be explained as a holdout from Captain Wallace’s service in the U.S. Army, it’s one of the many real-life Bing Crosby traits that the actor brought to his performance. 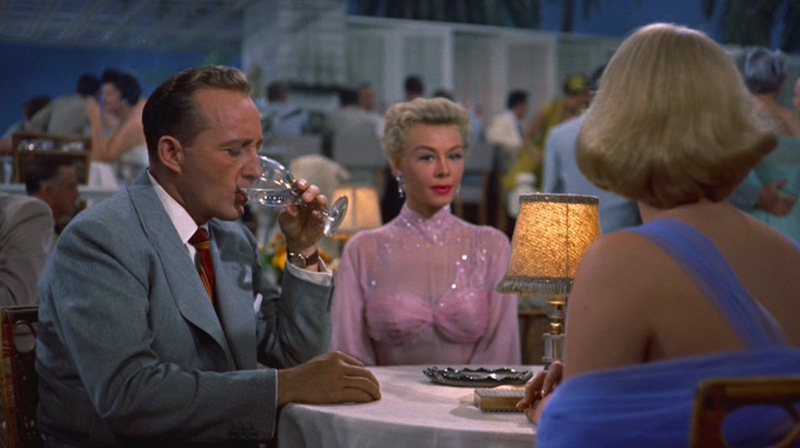 Bing’s wristwatch can be glimpsed on his left wrist as he raises his glass for a much-needed sip of water. When boarding the train to New York Vermont, Bob wears a short-brimmed gray felt fedora with a wide black grosgrain band. As Phil evidently left his cash in his “snood”, Bob is forced to dish out the $97.24 for train tickets. The fellas hardly had time to pack with the sheriff banging on the sisters’ dressing room door, but Bob’s got a pile of coats and jackets under his arm, some of which eventually appear during the duo’s duration in Vermont. 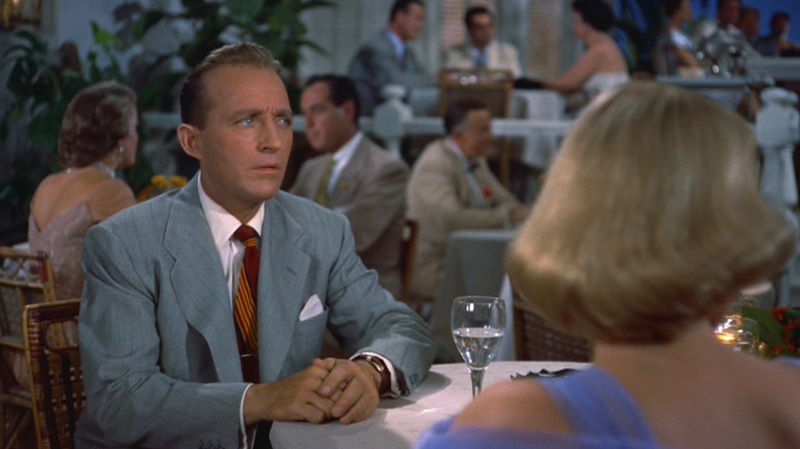 The real Bing Crosby was a natty dresser throughout his half-century career, and he brings his gift for sartorial flair to the Edith Head-designed costumes of White Christmas, particularly this colorful ensemble for a holiday evening out in Florida. Check out the movie, and have a very happy holiday season! You wouldn’t do this to me… after you dressed me up like a dame. Thanks for the prompt – I’m just about to start watching my copy of “White Christmas” and will look for the points you mention. Just recently discovered this great site. Excellent job Nick, Merry Christmas and Happy New Year !